Pascal did not have a famous cup; it was some other guy. Pascal did have a noteworthy barrel, however. It was intended to illustrate the principle named after him, which states that any difference in pressure in a fluid depends only on difference in height and not the shape of the vessel. That principle is the key to solving the puzzle in this post, though it's not entirely intuitive. 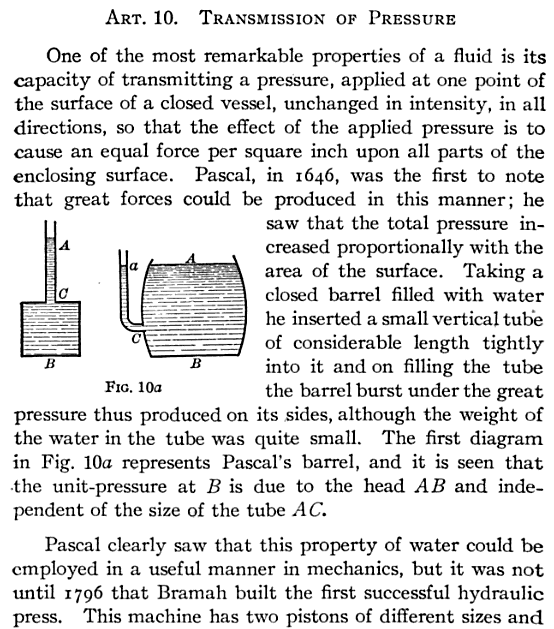 Pascal apparently performed an experiment in which he inserted a long vertical tube into a barrel and caused it to explode by filling the tube with a small amount of water. A contemporary attempt to recreate the experiment ended in failure, leading to the scientific conclusion that "barrel[s] were much shittier 100 years ago." The math checks out, though, and the source for the story points out that Pascal's principle eventually led to the hydraulic press.